The current party poker promotion “beat the ace” lasts until 6th January. Until then, every poker player has the chance to complete four missions (in an arbitrary order). For every mission you complete you get a free ticket for a $5.000 freeroll, which is taking place at the beginning of January. Thus, those who complete all missions can play for their share of $20.000 – and they have the best chances to play against Boris Becker. That’s because the results of the freerolls are going to be summed up in a leaderboard. The person who is leading in the end wins the main prize: A meeting with Boris Becker at the Heads-Up-Challenge. There, the leaderboard’s winner plays against the tennis champion in three games. Every won game gets the winner $5.000. If the player wins all three games he or she will get another $10.000 on top – which makes a total of $25.000. In addition, the player stays at a luxury hotel and gets $1.000 to cover his or her expenses. The live event’s place and date haven’t been announced yet. Since the freerolls are taking place on 7th, 8th, 14th and 15th January (at partypoker at 5pm Central European Time) the Heads-Up-Challenge with Boris Becker will very likely not take place before the end of January. What’s certain though is that you can get started from now on and collect your tickets. In order to do so get registered here if you haven’t got an account at partypoker yet. Afterwards, you can start with one of the missions. As soon as you’ve completed all missions you’re well-prepared for the $5.000 freerolls at the beginning of January. 1. Make a deposit into your partypoker account. 2. Eliminate an opponent in a Sit & Go. 3. Play 50 Sit & Go hands. 1. Play five Sit & Go Hero hands. 3. Win a Sit & Go Hero tournament. 1. Play 100 fastforward-hands . 3. 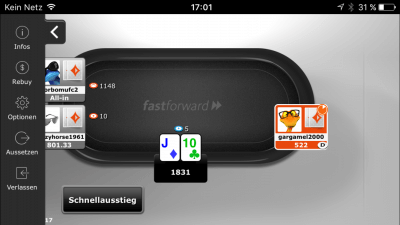 Double your chips with one fastforward hand. 1. Play ten Sit & Go Hero mobile hands. 2. Play ten fastforward hands on your smartphone or tablet. 3. Play ten cash game hands in the mobile App. 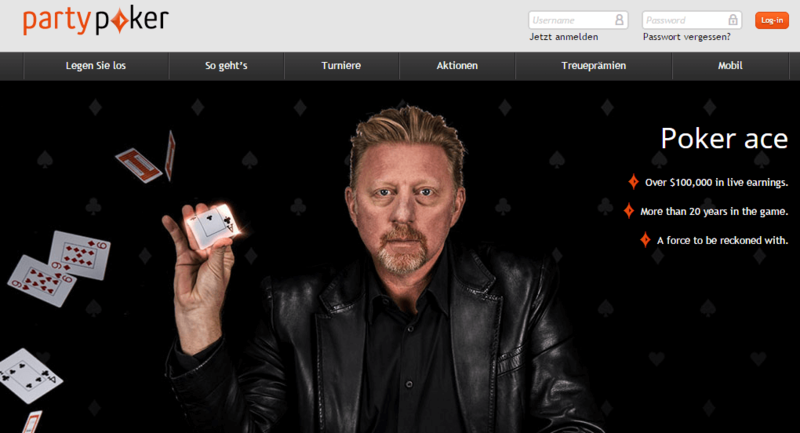 Poker and Boris Becker – this is not a new combination. Already until 2013, the former tennis professional was a poker ambassador – back then for the competitor PokerStars. In several tournaments Becker finished in the money. At live tournaments he has made $111.417 so far. Just in October 2016 – his first tournament after a three-year break – Becker ranked 13th in the partypoker WPT UK festival and won £15.000. Becker is looking forward to the cooperation with partypoker – and he even sees some parallels to tennis. When commenting on the deal he said “I learned to play poker a long time ago and I know that it’s a game where skill and perseverance are crucial. I hope that I’ll be able to use my experience from the tennis court to my advantage. ” He’s going to take part in several partypoker live tournaments but will also play a little bit online, as he said.